You kind of have to know why you need it and how/when to use it, but VTP brings convincing valve warmth to any signal. Great valve tone! Wide variety of colours. Subtle control of warmth. Useful presets as a guide. May be too subtle for some. Default setting gives misleading boost. Output Boost poorly calibrated. 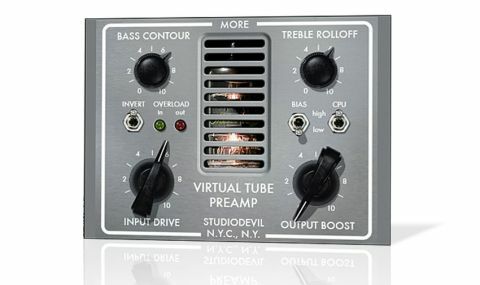 Virtual Tube Preamp is a plugin (VST/AU/ RTAS) that mimics the tonal and dynamic nuances of the classic 12AX7A vacuum tube (invented by RCA), which has been the central component in most of the great analogue tube preamplifier stages since the 50s. "Studio Devil's VTP enables you to virtually adjust the tuning of the components"
To date, Studio Devil hasn't exactly made itself known for its subtlety. Its flagship Amp Modeller Pro guitar amp sim is capable of shredding your face off at 50 paces, so this polite new addition to its lineup of processing plugins comes as something of a surprise, and its mild-mannered nature actually takes a bit of getting used to. The way in which the tube interacts with the other components is what gives different preamps their own characteristic tones, and some found more favour than others. Studio Devil's VTP enables you to do what you couldn't have done back in the good old days with the 'real' version, and that's to virtually adjust the tuning of the components, thus giving you access to a much wider array of tube tones. This is a plugin that can be used on anything from individual drum, guitar or vocal tracks, through sub-groups to mix busses and even your mastering chain. It's not only intended to warm up your digital sounds; it also acts like 'audio glue', melding parts together in a natural-sounding way, just like old analogue gear does so well. It's easy to be deceived when you insert VTP onto a track: by default, the Output Boost knob is a couple of dB above 0, giving the impression that your source immediately sounds better. In fact, without that boost, you might not instantly notice any difference at all. "Like a real tube, the harder you push it, the more the tone and dynamic response change as it saturates"
To look at, it appears to be nothing more than a simple drive and tone box - which, to an extent, it is. The beauty and joy of it, though, lies in the way the controls interact. Of course, the Input Drive control boosts the level of the input, but like a real tube, the harder you push it, the more the tone and dynamic response change as it saturates and limits the signal in a very musically sympathetic way. The Bass Contour parameter affects not only the tone of the bottom end but also the attack characteristics, so as you turn it up, you get more bass and a slower attack. This emulates the way the cathode bypass capacitor value affects the tone. The bass tone is quite thick, and we often found ourselves following it with a subsequent EQ in order to find the right weight. The Treble Rolloff mimics the effect of varying other capacitor values and is largely responsible for the perceived warmth of the tube. It features a subtle filter boost at the higher end, which brings in a useful crispness. The Output Boost control is used to balance the Input Drive. It could do with having the range drop lower: even at its minimum setting, the output is often still too high when using higher Input Drive levels, which means you have to pull the track level back, making it impossible to do a level-matched bypass comparison. Virtual Tube Preamp isn't a plugin that's going to make you go "wow", and we mean that in the best possible way. It's very subtle in its operation, doing a great job of replicating the sound and detail of tube colouration. As such, it successfully delivers a process that will appeal to those looking to imbue their recordings with the rich, lustrous tones of old.